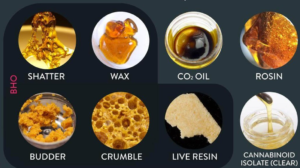 There are so many different types of cannabis concentrates nowadays, each with about a dozen nicknames, like shatter, budder, rosin, wax, and dabs. But what’s the difference? And which is the best? The truth is, it all comes down to two main distinguishing factors: whether or not solvents were used in the extraction process and the texture of the finished products. Solvents are liquids used for dissolving other substances. In the case of cannabis concentrates, different types of solvents, like butane, carbon dioxide, alcohol, propane or CO2, can be used to extract cannabinoids from flower, kief, shake, or trim to create a highly concentrated product. “Shatter” is typically made using butane as the solvent, and its more technical name is Butane Hash Oil, or BHO, for short. Another popular type of solvent extract is CO2 oil, used in most vape pen cartridges. There are two problems with solvent extracts like BHO or CO2 oil. For one, it is likely there is residual solvent leftover in the finished product, which can alter the flavor and quality of the extract. Plus, making these extracts is more dangerous and expensive than their non-solvent counterparts. That’s because solvents are volatile and flammable and the equipment needed can cost hundreds of thousands of dollars. The texture of solvent extracts often looks appealing. BHO done well has the clear, glass-like appearance “shatter” is known for. But that doesn’t make them higher quality or even stronger than solventless extracts. Both solvent and solventless extracts test between 60 and 90 percent THC, providing a much stronger high than regular cannabis flower. Solventless extracts, like rosin, are becoming increasingly popular for a number of reasons. For one, as the name implies, there are no solvents used in the rosin extraction process, and so no chance of smoking or vaping residual chemicals. What’s more, rosin and other solventless extracts are cheap and easy to make at home, especially with products like theRosin Tech Twist™, Smash™, or Go™. Rosin is basically solventless shatter. It’s made by pressing cannabis flower, kief, or trim between two very hot surfaces with a lot of pressure, basically squeezing resinous sap from the bud. The result is an extract with a sappy texture and translucent color. If rosin is made correctly, it will retain most of the flavor, aroma, and terpenes of the original bud, making it superior to solvent extracts which run the risk of containing butane, propane, or alcohol. All of these extracts can be consumed the same way – in a “dab.” Therefore, dabs are neither solvent or solventless extracts, but the way you smoke them. Dabs are typically vaporized using a dab rig, which consists of a water pipe with a “nail” attachment instead of a “bowl” to put flower into. The nail is heated using a blow torch, then consumers place a chunk or “dab” of extract onto the hot surface. The extract vaporizes quickly on the hot nail while the user inhales. 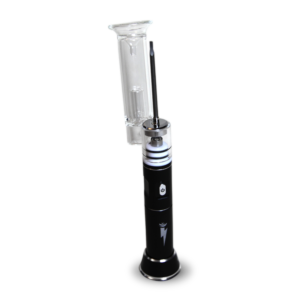 The vapor gets filtered through the water of the bong, giving a nice smooth hit of strong cannabis concentrate. If you find a blowtorch to be intimidating, there are other options. For people who want the convenience of setting an exact temperature on their nail, there are also electronic rigs (e nail), and portable dab rigs like the Trek Nail by The Electric Nail, which heat themselves with electronically with the click of a button.